Collaborative Wetland Workshop: John Bunker Sands Wetland Center | Alan Plummer Associates, Inc.
On March 7, 2016, operators and Water District personnel associated with two of the largest constructed wetland systems in the country met with APAI in a workshop format to exchange information about the systems, discuss lessons learned, and identify areas in which more work or research was needed. The constructed wetland systems represented were the George W. Shannon Water Recycling Wetlands at Richland-Chambers Reservoir, operated by the Tarrant Regional Water District (TRWD), and the East Fork Wetland, operated by the North Texas Municipal Water District (NTMWD). Both systems are large-scale water reuse wetlands approximately 2,000 acres in size and represent major components of each Water District’s total raw water supply. APAI has had the opportunity to work with both Water Districts throughout all phases of their projects – from initial planning and permitting through project commissioning and operations support. 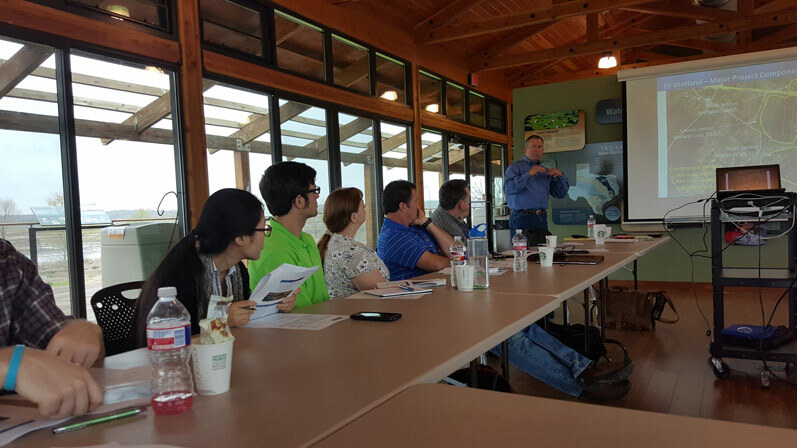 The workshop took place at the John Bunker Sands (JBS) Wetland Center, in Seagoville, Texas, located within the NTMWD’s East Fork Wetland project. Eighteen attendees participated in various discussion topics, including water quality, wetland operations, and vegetation management. Attendees also had the opportunity to listen to the JBS Wetland Center director provide an update on NTMWD’s partnership with the Center and their ongoing efforts to both facilitate research and educate the public on water reuse and water conservation.